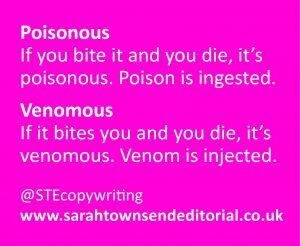 Poisonous vs venomous: wait – don’t they mean the same thing?! I confess, until I heard someone explain the difference between the two adjectives, I thought they were synonymous. Perhaps you’re the same. Hopefully this tip – summed up in the visual below – will help you remember the difference. You’ve probably heard people describe creatures such as snakes and spiders as poisonous: but unless you’re planning to eat them, venomous is more accurate. POISONOUS is used to describe something that’s toxic if you ingest it. So, if you bite it and you die, it’s poisonous. 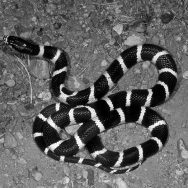 VENOMOUS creatures produce poison. If you’re bitten by a venomous snake, you could die.